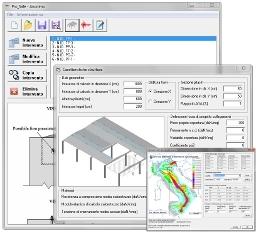 Industrial buildings design and verification of phase 1 of the interventions provided by the Reluis guidelines, support loss limit state verification calculation report. Seismic event of Emilia in 2012 demonstrated how vulnerable are industrial buildings. The most important critical issue of concrete precast structures is the lack of connections or their inadequacy to bear seismic loads. Unfortunately there was a large number of structures with sufferred problems of loss of support of the beams from the columns, or of the slabs from the beam, and also overturns of envelopes. To fix these issues Reluis (The Laboratories University Network of seismic engineering) wrote guidelines to describe local and global interventions for industrial buildings not designed for seismic resistance. Reluis guidelines are an important instrument not only for repairs but also for prevention. In fact they describes some simple interventions which rise the safety level of the existing precast buildings, without change the global behaviour of the structure. PRO_SAFE is developed basing on Reluis guidelines. The program allows to automatically design and check all the intervention proposed in the guidelines for industrial buildings. It also checks the risk of loss of support of precast elements.